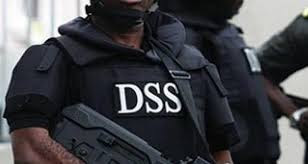 The Department of State Services (DSS) said it had arrested Lawal Mohammed, a suspected major financier and armourer of the dreaded Basalube kidnap gang in Kogi. A statement issued by an operative of the service, Mr Tony Opuiyo, today in Abuja, said the suspect was arrested on March 23, at Japama in Obajana Local Government Area of Kogi. Opuiyo said that the suspect was apprehended with two other members of the gang, Mohammed Tukur and Abubakar Ibrahim, by the joint team of the Service and the Military during the operation. He said that Tukur was identified as the Chief surveillance officer of the gang who coordinated the gang’s movement across Rivers, Edo, Delta, Kebbi, Zamfara, Kaduna, Kogi and the Federal Capital Territory, preparatory to the execution of their operations. The operative said that items recovered from the suspects include: three cell phones and 25 bottles of psychotropic inducers.